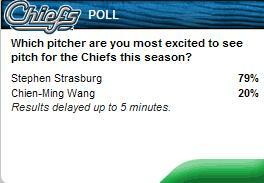 I’m pretty sure that 20% for Wang is mine – I threw him a courtesy vote so I could see what the actual tally was – because as cool as it would be to see a guy who won 46 games from 2006-08, including 19 each in the first two years, I can’t imagine anyone would be more excited to see him than Strasburg. As you might have noticed, we’re typically a little slow to unfold from the winter-long hibernation here at Bus Leagues. This is our third spring, and the routine is almost always the same: finish the season strong, fade away to virtually nothing from October to February, start working out the kinks in March, and really start firing on all cylinders in April. Just like the players, we need a little bit of spring training to get ourselves back in the groove. I bring this up because it is the best explanation for our ignorance to-date of Braves minor leaguer Jason Heyward. Heyward is Baseball America’s top-ranked preseason prospect, although you wouldn’t know it from the way we (and, in fairness, everyone else) wax poetic about Stephen Strasburg. Not that there’s anything wrong with Strasburg – it’s just that Heyward is pretty darn good too. He Tweets – Not only does Heyward have a Twitter account, he’s active on it, taking time to answer questions from his 3,000+ followers. That’s where I found out that he prefers oatmeal raisin cookies to chocolate chip (BLASPHEMER!) and grew up a Yankee fan (…). He Has Already Drawn Favorable Comparisons – Bobby Cox is 68 years old, 69 in May. He’s been around baseball, and the Braves, for more than fifty years. So while his statement that the sound of Heyward’s line drives is “kind of like ol’ Hank Aaron’s sound” might initially be taken as an off-the-cuff utterance of a grandfatherly old man, it also has to be considered as the wisdom of a guy who has seen a lot of good players in his day. Oh, who am I kidding – it was a completely crazy thing to say. All it does is make the public’s expectations of Heyward even more unreasonable. He Destroys Stuff – Earlier this spring, Heyward’s bombs to right dented cars and smashed windshields in a parking lot used by Atlanta’s front office, requiring a net be put up for protection. Once you get past the fact that these people continued to park there – maybe someone familiar with the Braves’ spring training facilities could shed some light on that, because I find it hard to believe that there was NOWHERE else to park safely – you realize how awesome it is: a 20-year-old kid consistently hitting the ball 450 feet. I tossed the idea around Bus Leagues headquarters, where it was well received (not a surprise, really; giving people stupid nicknames is one of our raisons d’etre). A few ideas were tossed around – Hank; the J-Hey Kid; at one point, Pookie was mentioned (I think Eric might’ve been drinking) – but nothing definite. So what we can do is backburner this for the moment. It’s only early March, no need to rush things. If you, the reader, happens to think of one that works, leave a comment or email us. Pay it forward. And when we have a few, we’ll figure out some way to pick the best one. But rest assured, Jason Heyward will be awesome. And he will be awesomely nicknamed. This is fact. Where Will Strasburg Start The 2010 Season? Stephen Strasburg is gonna rock some lucky fan base’s world in 2010. The question is, where? Tuesday morning, Nats manager Jim Riggleman “strongly hinted” that Strasburg would spend some time riding the buses in ye olde minor leagues to begin the season, the reason being that live game action against Double- or Triple-A hitters will provide a better overall measure of the phenom’s performance than a few spring training outings against major leaguers. Tuesday evening, of course, Riggleman “definitely didn’t rule out” the idea of Strasburg in a Natinals uniform on Opening Day. So really, nobody knows what the hell is going to happen. That leaves me with only one option: to assume that if Strasburg starts off in the minors, it will be in either Syracuse or Harrisburg, and to figure out when those teams might be coming to a ballpark near me. Because obviously, the main objective is to see this kid throw in person. I looked at the road trips for each of those two teams, but first the lightning in a bottle scenario: my second annual baseball road trip takes me through Washington in early June, either the fourth or the fifth, when the Nationals play the Reds. This guarantees at least a shot at seeing Jay Bruce, of course, and is also right around the time that Strasburg would likely be getting a callup if he does in fact go to the minors. So there’s that. It must be noted that my friend Chris, who writes for this blog, lives in upstate New York, so even if Strasburg gets called up at the end of May, he’s still a) playing his home games in nearby Syracuse, and b) making trips to Buffalo and Rochester. If Strasburg ends up in Triple-A and Chris DOESN’T see him at least once, he’s doing something wrong. I can’t help but notice, however, that journeys to my corner of the world are few and far between. There’s just one, actually, a four-game trip to Pawtucket in mid-May. It’s a longshot, admittedly, but it’s possible. I don’t know how the Eastern League puts together its schedule, but if you’re scoring at home, that’s three visits to Altoona, two to Bowie, and two to New Britain before the Senators wind their way up to northern New England in the last week of June. And that stop in New Hampshire, right up the road? Last week in July, my friends, by which point The Strasburg will most certainly have left the building. So the point of all this, I guess, is that unless the cards fall right, I’m unlikely to see Stephen Strasburg pitch this season. The bright side, though, is that Chris should have ample opportunity to see him if he lands in Triple-A, and fans in minor league towns up and down the eastern seaboard should have that same chance regardless of where he plays. You Mean There’s ANOTHER Man Muscles? The Minnesota Twins shook up their minor league coaching assignments today, shuffling three managers up the minor league ladder into new positions. Tom Nieto moves from Double-A New Britain to Triple-A Rochester, Jeff Smith moves from Class A-Advanced Fort Myers to New Britain, and Jake Mauer moves from the Gulf Coast League Twins to Fort Myers. Mauer’s name jumped off the screen when I first saw the story this afternoon, and as I poked around a bit it became clear why: his younger brother, Joe, is good at baseball. Jake was drafted the same year (2001) as Joe and played with him at his first couple minor league stops, but never got higher than Double-A before suffering a career-ending injury. He went right into coaching with the Twins, eventually ending up as the manager of the GCL team this season. The Twins finished 34-21 under Mauer, losing in the first round of the GCL playoffs (I say “first round”; it was actually just one game). So who knows: Ron Gardenhire is only 52 (well, his birthday is Saturday). Maybe he gets bored in another couple of years, the Boy Wonder steps in to take his place, and leads the Twins to glory. I just hope that if that happens, somebody checks on Sooze. She might not be able to handle the reality of two Mauers in the same dugout.